What: Book by Mark Van Voorhis and Ed Kugler; stage adaptation by David Webster. When: Friday, Nov. 30th; Saturday, Dec. 1st, and Sunday, Dec. 2nd. Cast members: Pete Law, Pastor Andy Kilps, Avery Tallent, Abby Calender, Jessica Brown, Daniel Ott, Daniel Wiehe, Ben Miller, Dan Fleming/J. P. Mayer, and Patra Jones/Rebekah Bryan. "The Well House" is simply one of the best books I have read. It was written by two friends, Mark Van Voorhis and Ed Kugler. 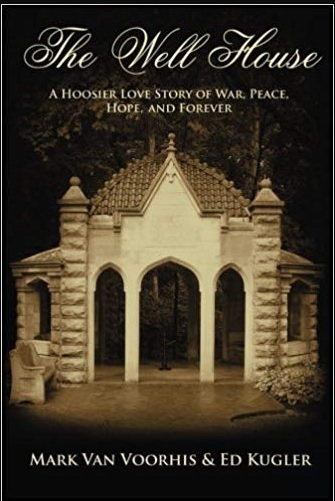 There is no better summary than what appears on the front cover which states the book is “a Hoosier love story of war, peace, hope, and forever.” I received permission from the authors to adapt it to a play, and a great cast will present it at WILLow LeaVes of Hope. I got to know Mark when he was around several years ago promoting the book because he selected Hope as the hometown for one of the main characters, Clayton Riggs. Mark thinks Hope would make a wonderful setting for a movie crew. Well, I am hoping a play might be a stepping stone to make that dream come true. Who knows? The director of the play and the gentleman portraying Clayton, Pete Law, freshly back from taking acting classes in Hollywood, just might have a part in the movie! Clayton goes from Hope High School to Indiana University in 1966. While at The Well House, he meets Maggie O'Reilly from Chicago. Clayton and Maggie develop a strong friendship, an unlikely one due to their diverse backgrounds. Clayton then joins the Marines and goes to the Vietnam War while Maggie ends up writing for the Chicago Tribune under the pen name Midge Madigan, often about the Vietnam War. Mark was enrolled in the IU's ROTC program while Ed joined the Marines immediately after high school and went to Vietnam. It was forty years afterward that they would pull their ideas together for a novel. They felt the first attempt was too long and later reworked it to 255 pages. I still found it very challenging to condense the great substance of this fictional novel to a ninety-five minute play. When my wife, Lisa, and I visited Washington D.C. on our honeymoon, I was emotionally drawn to the Vietnam War Memorial -- the hands on names, tears, notes, flowers. Many of us know someone who has served or who is now serving our country. It is my hope this play will pay tribute to our service men and women, and it will be a reminder to each of us of the many life changes related to war. Within the play, you will just get a hint about the 12 letters in the book from Maggie to Clayton which are superbly written. They were done in collaboration with Kathleen Connors, an archivist, historian, writer, and artist. You gain so much about their special friendship that transcends their differences about the war. And, there is the one letter from Clayton, the letter you wonder whether or not it will ever reach the hands of the intended receiver, Maggie. Clayton though made a wise choice of giving the letter to the one fellow Marine he knew who would carry out the mission, Moto. You will hear most of Clayton's letter in the play. During dinner at WiLLow LeaVes, Sally Webster will perform acoustic sets of mostly songs from the 60s-90s and will also insert all original songs during transition points in the play. Ben Cleland is our technical manager. I have a very short narrator part. Elizabeth Sexton, Hauser visual arts teacher, with her husband, Jeremy, and her students, Carly Archer, Raley Clark, Shelby Fugate, Brooke Hopkins, Leah Joyce, Courtney Nicholas, Kayla Poff, Melanie Taylor, Tristan Watkins and Alex Woodson-Johnson, designed the backdrop of the IU Well House which will be center stage for the performance of the play. We hope you will be able to attend. Books and posters will be available with the authors generously giving the donations toward production costs. Author Mark Van Voorhis plans on attending Friday and Saturday, all the way from Utah, and he will be available to autograph books and/or posters.